When it comes to measuring a video ad’s success, views aren’t everything. 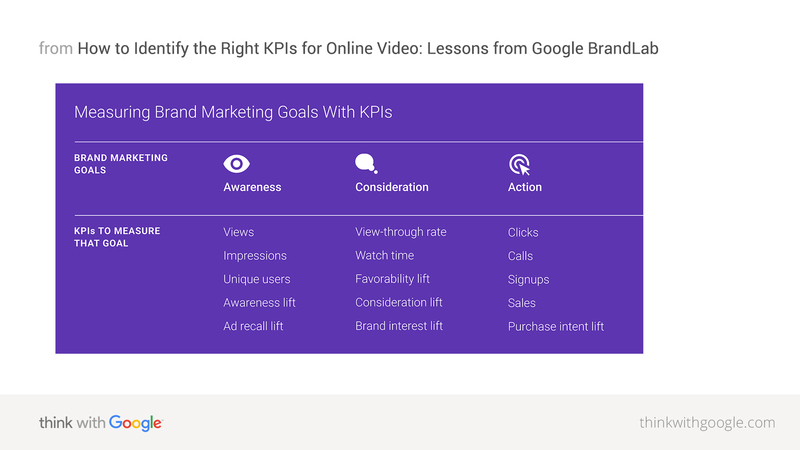 Kim Larson, who works with hundreds of brands each year as the global head of BrandLab, shares her four-step method for getting to the right key performance indicators (KPIs). "How many views means my video is successful?" 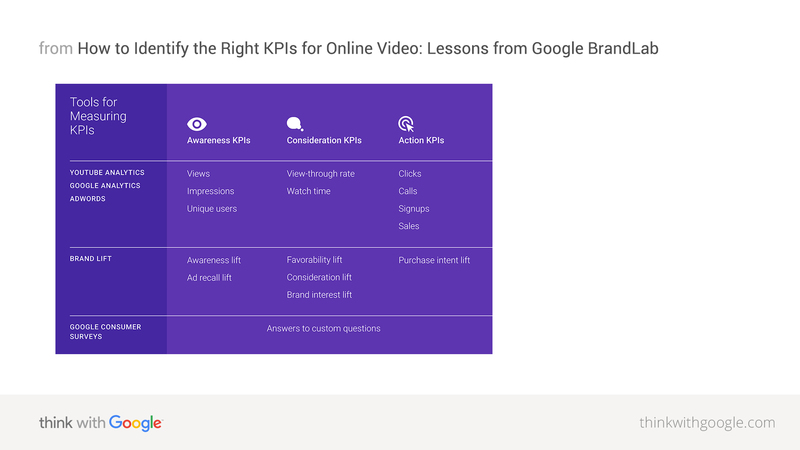 "Which KPIs should we be tracking to understand if our video campaign is successful?" Below, we share that exercise with you—the questions we ask, the answers we work toward—so that you can help your teams look beyond views, too. Question #1: What is your primary marketing goal for this campaign? As brand teams write briefs, they typically want their video advertising campaigns to increase awareness and consideration and ultimately influence their online or offline sales. While consumers may not have a simple, linear experience anymore thanks to a growing number of touchpoints—online shopping, reviews, mobile, social, etc.—most marketers agree their target audience fits into one of three categories: unfamiliar with a product, on the fence about a product, or ready to act. With each new campaign or initiative, it's important to know where your target audience is in their journey and their intent. Based on that, which of the three possible brand goals is your #1 priority? Question #3: What are the best video analytics tools to measure your KPIs? You've got your primary goal. You've got the KPIs that align with that goal. It's time to figure out how you'll measure them. There are three primary tools used to measure campaigns on YouTube: Brand Lift, YouTube Analytics, and reporting in AdWords. If you want to go beyond those tools and poll consumers on more specific questions, try running a survey with Google Consumer Surveys. YouTube Analytics, Google Analytics, and AdWords will help your team measure metrics like watch time, view through rate, and clicks. These metrics can act as a helpful scorecard, and you can log in while your campaign is running to track progress. But translating views or clicks to lifts in awareness, consideration, or purchase intent gets tricky. That's where our Brand Lift solution comes in. It measures your campaign's impact on big-picture brand metrics. Lastly, you can poll consumers with Google Consumer Surveys. These surveys don't have to be tied to a specific advertising campaign, but you could capture exposures to your channel or your ads and survey those exposures specifically. And you can ask those folks just about anything: if they've heard of your brand; when they'd like to hear from your brand; what kind of device they use; whether they prefer red or blue logos… the sky's the limit. Question #4: How will you optimise for your KPIs? After you determine your KPIs and how you'll measure them, a natural next step is to ask, "What's a good industry or competitive benchmark?" Unfortunately, it's not always that simple. Creative choices—length, music, logos, celebrities, etc.—vary too greatly among video ads for a fair apples-to-apples comparison, as do KPIs (was your competitor aiming for clicks or views? ), targeting (larger audience? smaller? ), and budget (did they have twice the budget to promote?). Instead of looking exclusively at competitive or industry benchmarks, we encourage marketers to set their own. Consider comparing your current campaign to past campaigns, for which your team will know creative variables, KPIs, targeting, and budget. If you don't have another internal campaign that has the same KPIs, consider using in-campaign reporting and optimisation to adjust creative and targeting midstride. An example of this might be A/B testing your own creative to establish a baseline. One of the great strengths of digital marketing is real-time optimisation. For example, you might use Brand Lift at the start of your campaign to figure out what's resonating, and then adjust your targeting or placements to reach the audience with whom your ads are working best. Putting one brand through the exercise above, and why it matters. Question #1: What is your marketing goal for this campaign? Tide's primary brand goal for these videos was consideration. Question #2: What are the KPIs for that marketing goal? As we mentioned in the graphic above, one good indicator of consideration is view-through rate (VTR). So, Tide focused on VTR as their primary metric for this campaign, coupled with Brand Lift. Question #3: What are the best video analytics to measure your KPIs? Tide saw its highest VTR ever on this campaign, measured using YouTube Analytics. Those views translated to a best-in-class consideration lift, measured through Brand Lift. Question #4: How will you optimise for engagement? In the second iteration of Tide's campaign, the team optimised for VTR using retargeting. Tide retargeted certain videos to its channel subscribers and to subscribers of the featured YouTube creators. Thanks to its efforts to optimise, Tide achieved a cost per view (CPV) of 50% less than previous campaigns. The Tide team led its campaign with a clear brand goal. The company measured the right KPIs using YouTube Analytics and Brand Lift. It optimised in real-time for efficiency and effectiveness. But above all, the Tide team kept the focus on their prize (versus focusing solely on views). Get everyone on board before the brief: Socialise your KPIs with your team and agency partners at the outset—even before you write your briefs. Different KPIs can affect the creative, the targeting methods, even the ad formats (e.g., skippable vs. non-skippable). Hold each other to your decision: Once everyone, including senior leadership, has agreed to specific KPIs, hold each other to it. Nobody—not even the CMO—can flip-flop and suddenly ask about views when everyone has been driving toward shares or clicks. Check-in often: Set up a cadence for analytics reports from your team. Know when you'll sit down to track progress against KPIs, pause lower-performing ads performers, and increase spend on engaging content that's delivering the target KPI. Hopefully now you have a better approach for tackling the question of "How many views means my video is successful?" The solution is to evolve the question to, "Which KPIs should we be tracking to understand if we're successful?" Honing your digital video strategy to find the most appropriate KPIs and metrics will not only ensure that your campaign goals are met, it'll enable your brand to reach your target audience in the most important moments along their customer journey.